Is Capital One's fourth quarter performance a canary in the coal mine or a small blip on the radar of a well run bank? Despite Samuel L. Jackson's best efforts in Capital One Financial's (NYSE:COF) commercials, Mr. Market was decidedly not smiling when the company recently reported earnings in which both expenses were up and revenue was down. Digging deeper, however, this recent disappointment is providing a great bargain on a company that's secretly getting stronger than ever. Capital One's fourth quarter marketing expenses were 9% higher than Q4 2012, while marketing jumped 43% year-over-year. That number shocked me at first glance, and explains Capital One's 4% increase in total non-interest expense (despite lowering other operating expenses). The bump in marketing spending caught the attention of the Wall Street analysts as well. Several questions on the quarterly conference call specifically addressed marketing. C.E.O. Richard Fairbank addressed the analyst concerns well, noting that the company sees a lot of opportunity which is driving spending. It's fair to question the effectiveness of marketing when top line revenue isn't growing, but there are signs that Capital One is gaining ground in the credit card market. Purchase volume grew 11% from 2012 to 2013, the highest of any of the major credit card lenders, and this growth in volume today should lead to earnings growth in the future. . When pressed further by analysts about the company's strategy, Capital One's C.E.O. said the company is going after the "heavy spender/transactor space and the revolver space, excluding the kind of high balance revolver." While it's difficult to define what exactly constitutes a "heavy spender," Fairbank went on to say that the company's goal was to capture accounts "that build value in the long term, that have lower attrition, low credit losses and build balances over time." In determining how much Capital One can grow in the "high-end" of the credit card market, it's worth comparing its market share to the current leader, American Express. American Express dwarfs Capital One, with total worldwide purchase volume over $900 billion in 2013, four times higher than Capital One achieved. Capital One is small, but the chance to peck away at American Express' business while growing with the entire credit card market means the opportunity is big. This is an encouraging strategy: going after the high end of the credit card market produces larger purchase volumes and customers who are more likely to be able to repay loans. Capital One is shunning "high-balance revolvers," the customers that continually keep a high credit card loan balance. These customers bring in high fees and interest income for the company, but also bring a greater risk of credit loss. When discussing high-balance borrowers, Fairbank said "We don't believe that the pricing there is, to our own projections, resilient enough. "By emphasizing risk management, Capital One has the conviction to shrink those segments that produce higher revenues during good times, but come back to bite you during the bad times which inevitably follow. Since 2009, Capital One has beaten the market but has lagged American Express and Discover, two other big credit card lenders. 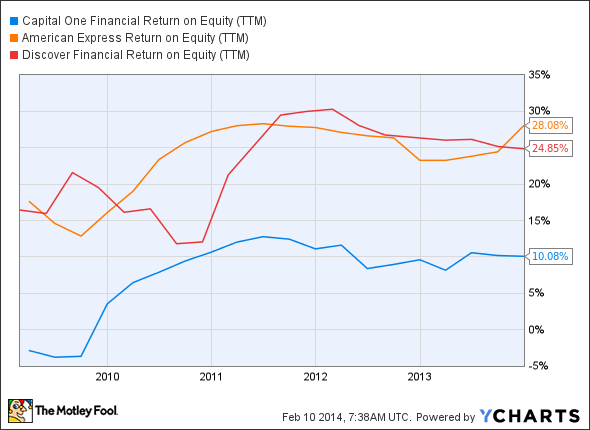 Looking at five years of return on equity for these companies shows American Express and Discover producing fantastic results while Capital One's performance has been relatively middling. But it's important to remember that Discover and AXP are almost exclusively credit card lenders and don't have Capital One's impressive consumer banking business. Consumer banking is a business that will never be able to achieve the same returns on equity during the good times, but is much more consistent when the credit cycle turns. What is Capital One worth? The company currently trades at 1.7 times tangible book value , while Discover and American Express trade at 2.8 and 4.9 times, respectively. If we're trying to determine a fair valuation for Capital One, we can assume that the consumer banking arm won't allow Capital One to achieve the same returns on equity as it's competitors. As a result, let's assume a fair multiple is 75% of Discover's; that would give Capital One a multiple of 2.1 times tangible book value, or $89.19 per share. Capitol One's Hollywood star-filled commercials give the impression of a bank that is all sizzle and flash. However, it's proving to be a well run bank that takes risk management seriously.